How did you get that stuff? I know you’re a very multicultural and always meeting musicians, right? Almost all of my CDs were given to me by friends, or by people that I met on tour. 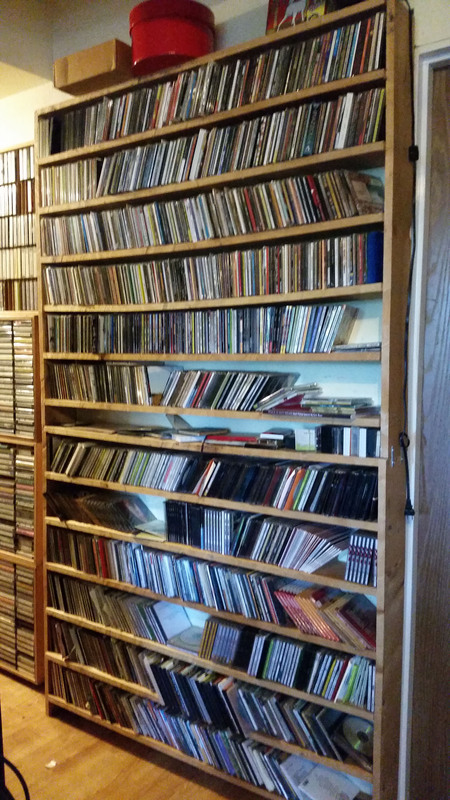 Not visible is a pile of about 400 CDs given to me that I have not had a chance to listen to yet! I plan to listen to each one, but I spend so much time on recording projects that I don’t listen to music spontaneously very much. 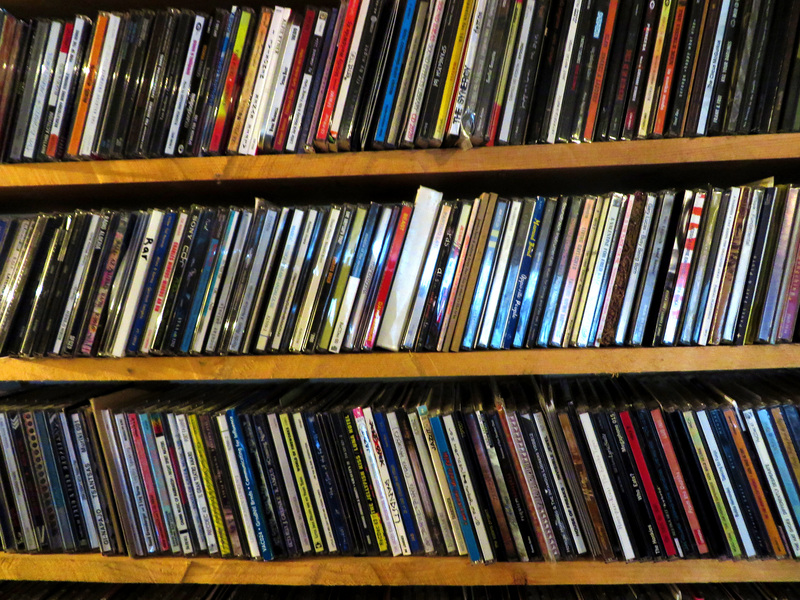 In reality, I hardly ever buy music! 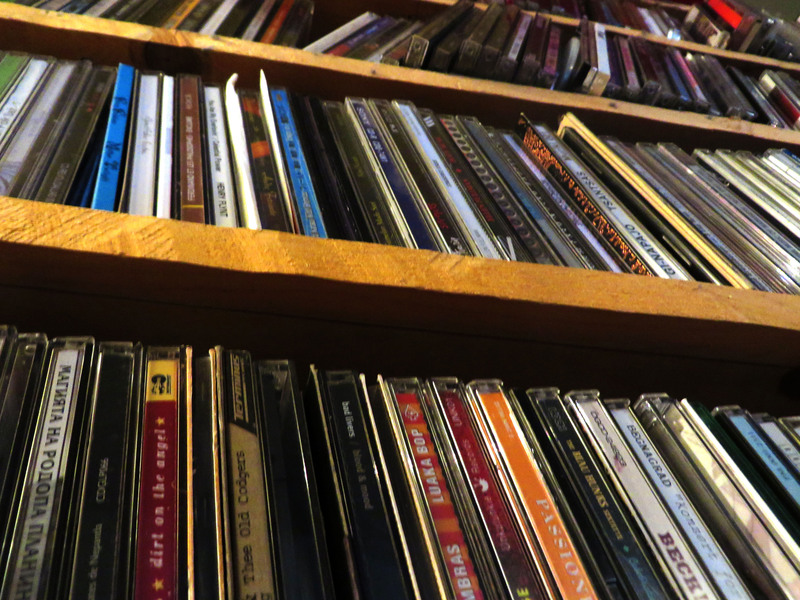 So you’re not a record addicted… You’re one of the first girls here on Concrete Shelves, and I have the impression that collecting it’s much more a male thing. I don’t like genre distinctions, but from trains to stamps, to toys, cards or records, usually, women are more able to avoid the collection mania. Do you see the same phenomenon among your friends and musicians? Maybe we, men, need more to ‘hold’ things? Interesting question regarding men needing to ‘hold’ things. As a rule, I try to avoid generalizing ~ but this discourse reminds me of the adage that in relationships between men and women, a man wishes for the woman to stay just as she was when they first met, and the woman is inspired by all kinds of plans of how to ‘improve’ the man. I do know women who collect things, sometimes to the point of mania (one friend’s dream was to have two houses, one for her black and white collections, one for her colour collections), so I can’t quite agree about gender distinction there. Also, within this particular sphere of innovative music, there are generally fewer women, so we’re statistically under-represented, haha! By the way, getting records from other musicians as gifts or exchanges, as you do, explains also why I found a lot of names that are totally unknown to me (maybe also because a different background we might have)… This allowed me to discover the Italian GI-NAPAJO, that I never heard but I knew the guys in the project (Gi Gasparin, Ignazio Lago, Paul Lago, Giò Lago! )… you’re half Italian, right? What’s your relationship with Italy? Though my last name is similar to a common first name in Napoli, my family name is actually anglicized French, from the name De Noyon. I am French, Irish and half Welsh (Gallese). Despite that, Italian things really resonate with me, and have since I first stepped foot there in 1990 with my trio the Tone Dogs. I was amazed by the good feeling I had there – warm people, sumptuous food, beautiful light, amazing art, etc. I began to wonder what my new friends were laughing at – and ultimately I discovered that I share a similar sense of humour, to laugh at adversity to help one move beyond it. I began studying Italian, and slowly I began to progress beyond ‘grazie’ and ‘prego’. In 2001 was asked by Giampaolo Rampini to join a band in Trieste called Quintetto alla Busara, so I began learning Italian in earnest. Since then I have had the honour to collaborate with all kinds of independent (and sometimes quite successful) Italian musicians. As I improve speaking and understanding the language, in Italian I feel 100% myself; I think of new concepts, make new connections between things, and am entirely inspired speaking Italian. English is fine, but very pragmatic. When I submerge myself in Italian, I feel like Super Woman! Amy Denio is a Seattle-based multi-instrumental composer of soundtracks for modern dance, film and theatre, as well as a songwriter and music improviser. She is probably best known as a vocalist, accordionist and saxophone-player. Among her current musical involvements are The Tiptons Sax Quartet (formerly The Billy Tipton Memorial Saxophone Quartet) and Kultur Shock, a Balkan punk metal sextet based in Seattle.